Since 1997, the Greene County Soil & Water Conservation District (GCSWCD) has been working in partnership with the New York City Department Of Environmental Protection Stream Management Program (NYCDEP-SMP) on the development of comprehensive Stream Management Plans (SMP) for streams which supply the City’s upstate reservoirs. In 2002, this process was extended to the West Kill watershed, and working with a local project advisory committee a detailed management plan for the West Kill was completed. A sub-basin of the Schoharie Creek, the West Kill is located in the southwest section of Greene County with its origin on the southwest slopes of Hunter Mountain (4000′). The stream is approximately 11 miles long, with a contributing drainage area of 59 square miles. Located in the Town of Lexington, the West Kill Stream has a reputation as a productive wild trout fisheries. The West Kill has benefited from cold, groundwater contributions and a fairly good riparian zone which shades the stream. The West Kills fishery was a favorite spot of noted angler and author Art Flick, who made it the subject of his writings. The Westkill Valley also has a long history of damaging floods. From a flood event in 1927 which wiped out every bridge in Spruceton valley, to more recent events in 1996 & 99 which resulted in significant instability in the stream corridor and over 5 million dollars in damages to public infrastructure. On December 31, 2005 the GCSWCD and NYCDEP-SMP completed the first draft of the West Kill Stream Management Plan which was presented to the USEPA as a component of the City’s watershed protection program. The SMP represents the most detailed assessment of the streams physical condition that has ever been completed, and it is backed by several years of field collected data as well as extensive research and analysis of many factors which may influence stream stability. This section provides watershed background information and characteristics which influence the West Kill. A chapter on living streamside and stream related activities may be of particular interest to landowners, answering commonly asked questions, including necessary permits and agency contacts, relating to activities which may impact stream health or stability. This section includes a summary of water quality assessments that have been undertaken over the years in the West Kill, an introduction to the science of stream processes, and a description of the watershed assessment protocol used to develop this stream management plan. This section contains very detailed descriptions and specific recommendations for the West Kill, from the headwaters at the top of the watershed, downstream to its confluence with the Schoharie Creek, located in the Town of Lexington. 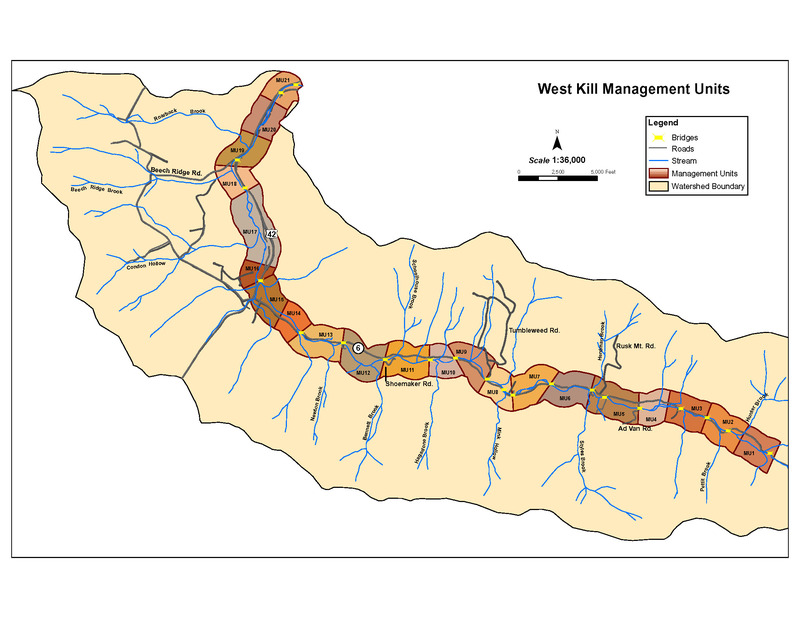 The West Kill mainstem has been organized into 21 Management Units (MUs), defined using physical stream characteristics, historical channel alignments, location of bridges and road infrastructure, and valley characteristics. These MU descriptions outline stream conditions (its bed and banks), general streamside (riparian) vegetation condition, and proximity and arrangement of roads, bridges and culverts. This section sets forth an extensive list of recommendations related to education and outreach, flood protection, water quality, public enjoyment, fisheries, riparian zone management, stream management, and programmatic issues, providing a frame work for watershed stakeholders to develop a long term management strategy to protect and improve the West Kill.